Two laps women, three laps men. You start on the left-hand side of Redston Playing Fields and belt down to the southern tip of Newlands Playing Fields (flat); you then turn and cut around the south perimeter of the cricket pitch (still flat) before taking the first left turn on the path (medium ascent begins), which you will follow before cutting across the grass up to the second of the two main paths going laterally across the park (flat on the lateral); after you pass the pitch and putt on your right you turn right up south slope to the road (big climb); but you turn left before you reach the road to go lateral, come on a descent (steep) by the straight path of the left side of the south slope to join the Redston Playing Fields again. 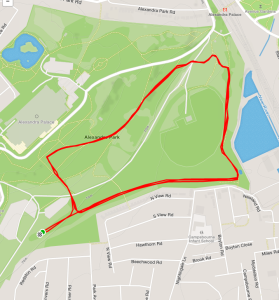 If you have more laps to complete then you turn left and repeat the route; if you are on your final lap you turn right and sprint for the finish. 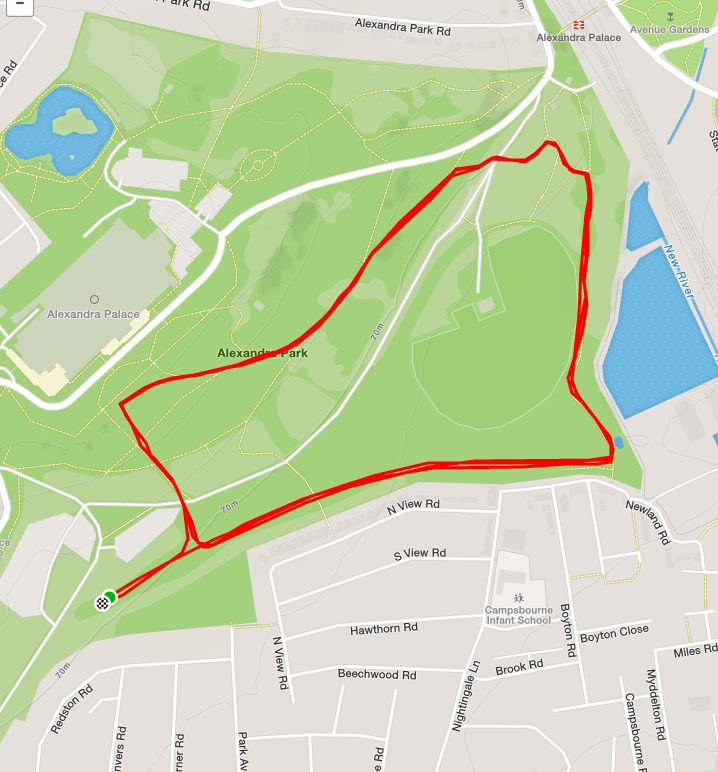 Mostly grass (75%); with some trail [the moderate ascent and the main lateral (20%)]; and just a little bit of path (5% around the cricket pitch). The grass areas are the kind that if the weather is good are like running on good football pitches (firm ground covered by grass), which means if we have heavy rain leading up to the race: expect mud. Spikes will serve you well. There are toilets in the garden centre and the Palace ITSELF (and its pub) if people need them and to change, but they are no official changing areas. By tube: go to Finsbury Park (Victoria or Jubilee line), and take the W7 or W3 bus towards Muswell Hill and Wood Green, respectively. If you take the W7 bus, get out at the bottom of Muswell Hill by the Victoria Stakes pub and the park is across the junction to your right; if you take the W3 the bus will take you into the park and you can disembark there. By car, the postcode to drive to is N22 7AY. If possible in the park the Redston Playing Fields car park is the closest to the start, but both the Dukes Avenue and ice rink car parks are also very close. By Rail, if you are coming into London via the lines from Welwyn Garden City or Letchworth Garden City you can go to Alexandra Palace mainline station, but unless you are coming from those destinations, tube route is recommended. The mainline station is on the other side of the park from the start and leaves you with the longest walk to get there.